Has your hair been badly damaged over the years? If so, it’s not the end of the world. Here are 10 tips for bringing damaged hair back to life. Are you looking for ways to bring your damaged hair back to life? Hot tools, frequent dyeing, exposure to the sun and using the wrong shampoo are all factors that can lead to severe hair damage. You apply the best products on the market, trim the split ends and wash your hair frequently. And yet, it still doesn’t look fresh and lively. In reality, your current hair care routine could be entirely wrong for your hair type. For example, keeping your hair long when it’s extremely dry and damaged is not doing you any favors. That’s why finding the right haircut for your hair type is one of the first steps to remove the damage. Keep reading to discover the 10 best tips and tricks for giving your dull and brittle hair a breath of fresh air. 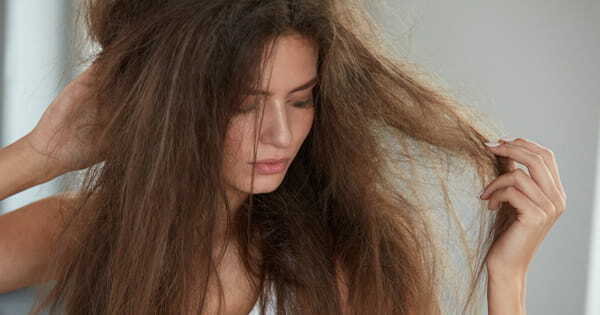 Your hairbrush may be the reason why your hair is frizzy and wild. If you’re using the wrong brush for your hair type, you’ll end up with split ends and static electricity that’s hard to tame. Also, if you brush your hair in the shower while it’s wet, you’re doing irreversible damage to it. The brush will make the hairs thinner and prone to breakage. So, consider combing the hair with a wide-tooth comb or detangling brush after you apply conditioner. If you’re not sure what brush to use for your hair, ask your hairdresser for advice. You can also do some research online. For example, a quality boar bristle brush will distribute the oils from your hair down to the roots. The end result is less oily scalp and shiny, luscious hair throughout. If you use a lot of products for washing and styling, your hair can suffocate and dry out. To remove product buildup, make a clarifying treatment with baking soda paste and apple cider vinegar. Alternatively, get a quality clarifying shampoo that’ll make your hair squeaky clean. The easiest way to get rid of split ends and hair damage is to trim your hair. Don’t make the mistake of cutting your own hair with kitchen scissors. Hairdressers work with the highest-quality scissors specifically made for cutting hair. Your multi-purpose scissors could do even more damage. If you’re not sure what haircut will fit you, talk to your stylist. They’ll help you decide on a simple, low-maintenance hairdo that you can style without further damaging your hair. Getting a good deep conditioning treatment once a week will nourish your hair and restore its natural shine. If you have very dry hair, doing a hot oil treatment once a month will help moisturize it. Wash your hair, dry it with a towel and apply your favorite hair oil. You can also use extra virgin coconut, olive, argan or jojoba oil. Cover your hair with a plastic shower cap and wrap a heated towel around it. Let the oils do their magic for an hour or two and rinse with cold water. Did you know the foods you eat influence the quality of your hair? Your diet should contain foods rich in protein, iron, omega-3, and vitamins C, A, and E. You can find these nutrients in eggs, fish, green leafy veggies, carrots, avocados, whole grains, citrus fruits, and nuts. Your body will distribute them to your organs, skin, and hair. Staying hydrated is crucial to repairing damaged hair. Getting enough liquids will help your hair grow and replenish itself. Eight glasses of water a day or smoothies, juices, fruits, and soups will provide sufficient moisture to your follicles and scalp. Hot tools are one of the main causes of damaged hair, especially if used daily. The best way to give your tresses a break is to stop using heat for styling, at least for a few weeks. Also, aim for air-dried hair whenever you can. If you must use hot tools, make sure to apply heat protectant sprays and serums. These will create a protective barrier between the hair and the hot plates. Most hair dyes contain ammonia. This is a strong chemical that locks in the color inside the follicles and hair. Lighter hair dyes almost always contain peroxide, contributing to extremely dry hair. Letting your hair go color-free for a while is the best way to help restore its health and recover from damage. And if you must dye it, leave it to a professional rather than doing it yourself at home. Ask for ammonia and peroxide-free colors to reduce damage. Long-term exposure to harmful UV rays from the sun can lead to damaged hair, fading color and split ends. To protect your hair and prevent damage, apply hair products with sunscreen and wear hats whenever you’re out in the sun. After a day at the beach, your hair will benefit from a deep conditioning or hot oil treatment. When swimming in a pool, wear a special cap to prevent chlorine from damaging your hair. Washing your hair every day can actually dry it out it even more. Commercial shampoos strip the scalp of its natural oils to provide that clean feeling. When properly distributed, sebum makes your hair shiny, smooth and healthy. And if you keep removing it, the skin on your scalp will start producing more to overcompensate. As a result, you end up with oily, messy hair one day after another. So let your hair balance itself out. Go without washing for three days and use a good dry shampoo in between. It’ll take a while until the hair starts to produce normal amounts of sebum, but be patient and the results will come. Now You Know How to Bring Your Damaged Hair Back To Life! You can have a beautiful, voluminous, healthy hair if you follow our damage repair tips and tricks. Before you settle in on a hair care routine, do some research on your hair type. Ask your hairdresser for advice. Try out different products and see what works. And most importantly, eat the right foods. Need to freshen up your hair or get a whole new look? Contact us today to make an appointment. In the meantime, check out our blog for useful hair tips!